Insider Monkey has finished processing more than 700 13F filings made by hedge funds and prominent investors in Q3. These filings show these funds’ portfolio positions as of September 30. What do these smart investors think about Platform Specialty Products Corp (NYSE:PAH)? Hedge funds have been steadily losing conviction in the stock. Just 24 of the funds tracked by Insider Monkey’s database were shareholders of the company on September 30, 33% fewer shareholders than there were in the middle of 2017. Billionaire Bill Ackman was not one of those to sell off the stock, as he believes the market is still undervaluing PAH ahead of the completion of the sale of its agricultural business. “Performance Solutions is a high-quality business with a strong competitive position in secularly growing end markets which will operate with significantly less financial leverage than Platform has today. Based on analyst estimates for the remaining business, Platform’s shares trade at less than 12 times next year’s earnings, a large discount to competitors,” Ackman stated in Pershing Square’s Q3 investor letter, which you can download here. We’ve uncovered a reliable way to consistently beat the market by using these 13F filings and investing in only the top consensus picks of the 100 best performing hedge funds each quarter. Insider Monkey’s flagship “Best Performing Hedge Funds Strategy” has returned 96.9% since its 2014 inception (through November 2), beating the market by over 40 percentage points. Check out a detailed analysis of Insider Monkey’s performance and past quarterly stock picks for all the details. Our newest picks will be released later this month; don’t miss out! What does the smart money think about Platform Specialty Products Corp (NYSE:PAH)? At Q3’s end, a total of 24 of the hedge funds tracked by Insider Monkey were long this stock, a decline of 11% from the previous quarter. 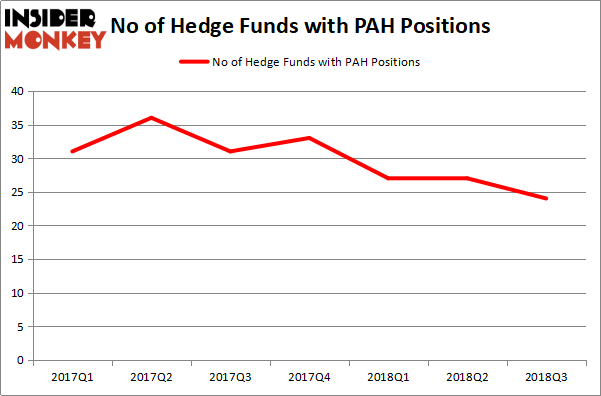 Below, you can check out the change in hedge fund sentiment towards PAH over the last 7 quarters. With the smart money’s sentiment swirling, there exists an “upper tier” of notable hedge fund managers who were adding to their holdings substantially (or already accumulated large positions). 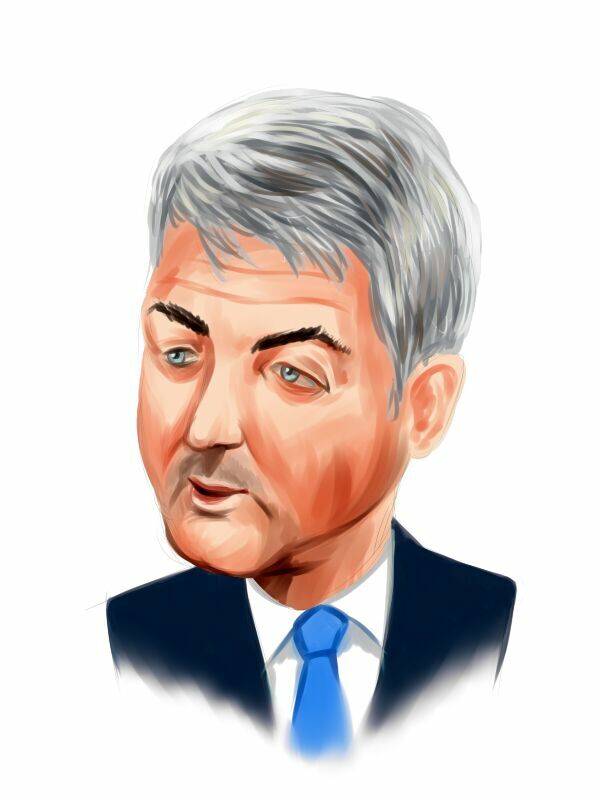 More specifically, Bill Ackman’s Pershing Square was the largest shareholder of Platform Specialty Products Corp (NYSE:PAH), with a stake worth $504.4 million reported as of the end of September. Trailing Pershing Square was Bares Capital Management, which amassed a stake valued at $234.6 million. Glenview Capital, Elliott Management, and Gates Capital Management were also very fond of the stock, giving the stock large weights in their portfolios. Since Platform Specialty Products Corp (NYSE:PAH) has faced bearish sentiment from the entirety of the hedge funds we track, it’s easy to see that there exists a select few money managers that elected to cut their full holdings in the third quarter. Interestingly, Michael Weinberger’s Cerrano Capital Management dumped the largest investment of all the hedgies watched by Insider Monkey, comprising about $21.5 million in stock. Jim Simons’ fund, Renaissance Technologies, also cut its stock, about $5.8 million worth. These bearish behaviors are interesting, as aggregate hedge fund interest was cut by 3 funds in the third quarter. Let’s now take a look at hedge fund activity in other stocks similar to Platform Specialty Products Corp (NYSE:PAH). We will take a look at MasTec, Inc. (NYSE:MTZ), Regal Beloit Corporation (NYSE:RBC), Deckers Outdoor Corporation (NASDAQ:DECK), and Kennametal Inc. (NYSE:KMT). This group of stocks’ market caps are closest to PAH’s market cap. As you can see these stocks had an average of 23 hedge funds with bullish positions and the average amount invested in these stocks was $373 million. That figure was $1.35 billion in PAH’s case. MasTec, Inc. (NYSE:MTZ) is the most popular stock in this table. On the other hand REGAL-BELOIT CORPORATION (NYSE:RBC) is the least popular one with only 17 bullish hedge fund positions. Platform Specialty Products Corp (NYSE:PAH) is not the most popular stock in this group but hedge fund interest is still above average. This is a slightly positive signal but we’d rather spend our time researching stocks that hedge funds are piling on, like MTZ.